The Witchmen as a dance side have always been and still are among the great sides to see in performance. I can’t remember when I first ran into them but Rochester Sweeps when the Mathematical school was used for camping and shower arrangements were at the girls school rings a bell. Whenever it was and down through the years Terry Dix has been a constant fixture, along with Linda leading the music that is such a feature of the team’s performance. Since Terry must now rate as one of the most photographed dancers in the country and given that amongst his interests is “avoiding a third heart attack” he seems a good choice for a question and answer session that gives us an insight into characters who make the world of dance more colourful. Doug: what first got you interested in the Morris? Doug:: Just how long have you been dancing and where did you start? I started in 1975. I went straight up to that particular group, which were the Northampton Morris Men, had a bit of a chinwag, took the shilling and joined up there and then. I took to it like a duck to water. Became Bagman '79-'81, Squire and Foreman '81-'83, Foreman '83onwards, until the Witchmen formed in '85. Doug: Have you ever tried any other style or tradition? Seriously, only the hankie waving. I once had a go at Rapper in a practice session. We didn’t have any swords, so we used hankies …….long stiff ones! Didn’t bother again after that. I also did a bit of mumming with the St. George Mummers, and played side snare drum for the Maids of the Mill NW, both from Kettering. Doug: What has been the high spot of your time dancing? That’s a hard question. I’m not easily impressed. If you’re pushing me, I suppose being asked to perform as part of Ashley Hutchings “Grandson of Morris On” show at Sidmouth F/F in '02 was quite an elevated spot, being on a stage and all. Being asked to do it again in Rochester Cathedral in '03 as part of the Sweeps' Festival was pretty cool. Now, what I’d really call a high spot would be to do a turn in the middle of a Mediaeval Baebes' show..……that would impress me. That would be absolutely marvellous! Doug: And the low spot? That’s got to be my second heart attack. I thought the second one was going to be my farewell performance! We were dancing at Chester F/F in 2000, and in the middle of our dance “Grim Reaper” (quite an apt title) I had a severe angina attack, a right nasty one, that took ages to subside. But at least the heart attack proper waited until I was unpacking the camping kit on the Tuesday! Apparently you can see blue lips through the blacking. Quite spectacular looking. Anyway, I clearly survived, but it left me with a bit of a stutter for about a year and a partial memory block that’s ongoing. So, if I seem a little bit vague when I talk to someone, it’s because I’m trying to remember if I already know them, if I know them well and, of course, their name. Yeah….I’d say that was my low spot. Doug: What or where do you consider the strangest dance spot/dance out you ever took part in? Two places come to mind. The first, in the late seventies, was a spot at a gay nightclub. We weren’t aware that it was such until midway thru' a dance, we noticed that all the men were dancing with men, and women with women. I was dancing Cotswold at the time (hey, that’s men dancing with men!) and being ogled by men was not an experience I care to repeat. As we finished our display, we exited rapidly thru' the fire doors. Our fool appeared half an hour later looking bedraggled and decidedly shell-shocked. The other place was in a swimming pool. An empty one. Doug: What advice would you give to a newly formed dance team? Well since you’ve asked, I’ll say this. It would be a good idea to concentrate on your actual dancing skills and perfect your performance, and not on what you look like. I see the Border teams as the main offenders. They spend months making their kit/costumes (really quite outstanding, some of them), but spend only five minutes, relatively, on their dancing practice. The trouble is that it looks like they’ve only practiced for five minutes, and no amount of “WE DO IT FOR FUN” will wash! Doug: Given the major part that music plays in a team’s performance, what advice if any do you have for musicians – you can ask Linda if you’re not sure! Decide what overall sound you want to produce for the team. The music should compliment the dancing and not overwhelm or oppose it. We prefer a melodeon/concertina mix and drums, to produce an earthy, primitive sound. It is important in this respect that your drummers can actually play the drums, subtly, and not beat the poor things to death! People have said they can always tell our band from any other, which is nice, because they do work hard at it. And just have one band leader, not a band full of leaders! Far too often a band will consist of every team member who can play an instrument, any instrument, believing that “more is better”. Believe me, it’s not! Doug: Is there one aspect of the Morris world today that you would gladly see consigned to the scrap heap? Yes. All those teams that do it for the wrong reasons, such as to keep fit. Let’s do it to perpetuate our wonderful traditions. End of rant! Doug: Is there one aspect of the Morris world you would fight to keep above all others? The right to dance or perform your traditions whenever and wherever you choose to. Doug: As a dancer you’ve been to most major festival. Do you have a favourite and if so what makes it so good? I suppose people would expect me to say Sidmouth or Whitby, but to us in this middle bit of England, they’re not seen as the ultimate in festivals. I did say I wasn’t easily impressed! It’s a toss of a coin really. Warwick FF is always great fun…been going there for more years than I care to remember, and will continue to do so. I think my favourite has to be Ely FF. It’s a place to relax and unwind. Quite a small festival compared to the others, but it has a charm of its' own. It’s a marquee festival with everything on site. Concert tent, ceilidh tent, beer tent and market stalls. Who could ask for more? Each year I run a w/shop which is always bursting at the seams. I’ve been going there for over twenty years now. I suppose it’s quaint and rural, just like me. 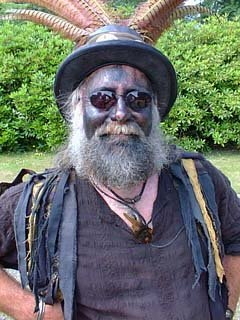 Doug: You describe the Witchmen's style as “other”, what separates it from what many would see as border morris? The term “other” morris comes, of course from author Terry Pratchett. When we moved from doing the traditional border dances to self penned ones, it was evident that our style would also change. As we were now using English myths as the basis for our dances and incorporating the stories into the introductions, I harked back to some of his ideas and thought that the term “other” morris fitted us so well. Mixed with the unusual tunes that we use, I think it describes us very well indeed. Doug: Finally what other interests do you have out side of dancing- keep it legal, decent and honest! My main interest at present is sinning. Sorry that should read as singing (Linda says it was correct the first time). I sing three part unaccompanied English traditional songs with Linda and Ruth (concertina…Witchmen). Linda and I used to perform as “Stone Moses” with another lady back in the early seventies. We're now back to the singing, after a gap of more than 20 years, as “hex”, with young Ruth. We've already sung at several festivals, and have a CD out. You can find us via the Witchmen website. I'm hoping that the singing gigs will continue to grow because these days, it takes me ages to recover from a w/end of dancing. And, to be honest, none of us are getting any younger, are we Doug?